University of Arizona scientists have discovered an unknown mechanism that establishes polarity in developing nerve cells: the length of a signaling molecule. 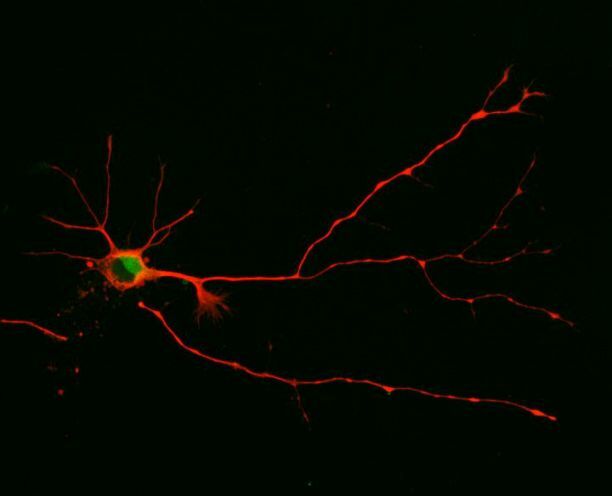 Understanding how nerve cells make connections is an important step in developing cures for nerve damage resulting from spinal cord injuries or neurodegenerative diseases such as Alzheimer’s. They found that embryonic nerve cells manufacture a signaling enzyme called Atypical Protein Kinase C (aPKC) in two varieties: a full-length one and a shorter one. Both varieties compete to bind the same molecular partner, a protein called Par3. If the short form of aPKC pairs up with Par3, it tells the cell to grow a dendrite, and if the long one pairs up with Par3, it will make an axon instead. When the researchers blocked the production of the short form, the nerve cell grew multiple axons and no dendrites. When they created an artificial abundance of the short form, dendrites formed at the expense of axons. Funded by the National Institutes of Health and a scholarship awarded to Parker by the Achievement Rewards for College Scientists Foundation, Inc., this research resulted from a collaboration of three UA departments — cellular and molecular medicine, pharmacology and physiology.